The Kerry-Springsteen concert in 2004 drew 80,000 people. And the Obama-Springsteen concert in Cleveland back in 2008 drew 80,000 people. The Obama-Springsteen concert today in Madison, Wisconsin drew only 18,000. 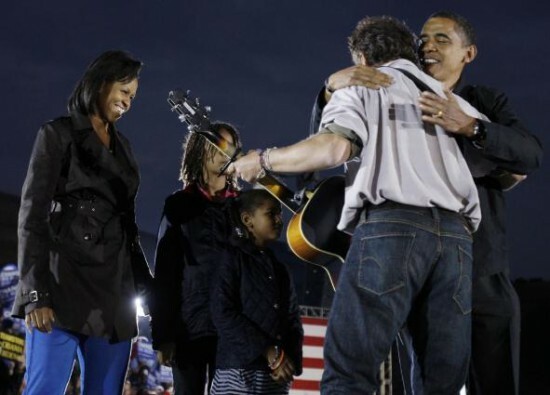 The crowd for President Barack Obama’s final rally in Wisconsin with Bruce Springsteen is falling short of the audience John Kerry drew with the musician in 2004. The White House put the crowd at 18,000 for Obama and The Boss in Madison Monday morning, far less than the 80,000 the defeated Democratic nominee drew eight years ago just before the election — a turnout that caused a small panic inside the Bush campaign. Oh, and the Obama camp was expecting 30,000.